Thank you for choosing the Hotel Miramar! Welcome, Thank you for choosing the Hotel Miramar! We have taken every care to ensure that your room will be clean, pleasant, comfortable and well equipped. Should you require any additional service or you have any comments regarding your stay at our hotel, please contact the person on duty at the reception desk. Wishing you a most enjoyable stay. The hotel reception is manned 24 hours around the clock. Should you have any request or you require any information please contact reception. For instructions and surcharges for outside calls, please consult tent card next to phone. Any changes in the length of stay from the original reservation must be coordinated and accepted by the hotel 24 hours in advance. Charges will be made for Pre-mature departures less than 24 hrs. We can assist with any changes regarding flights and with confirmations, please contact reception. Check-out time is 12:00 (noon) on the day of departure. Please note that a surcharge may be added to your bill for a late check-out. Should you wish to have a late check-out please contact reception to make the necessary arrangements. When vacating your room, please make sure that you have taken all your belongings. Please lock the door and leave the key in reception desk. You may settle your account with a credit card, cash or traveler’s checks; we regret that personal/private checks are not accepted by the hotel. Our hotel accepts Visa, American Express, MasterCard and Debit cards. M Café & Bar is a casual space located in the main lobby of our Hotel. 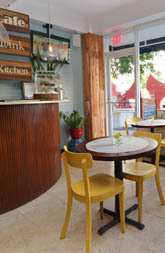 The concept, created by Chef Angel del Valle and Business Partner Yamil Pomales, was intended to provide San Juan metro area residents and our hotel guests with a unique coffee experience in the trendy Miramar area. Alongside coffee, Herencia offers a select menu for breakfast, lunch and dinner. It will be a showcase for Chef Angel del Valle's distinctive cuisine. Breakfast is included for 2 people on some of our rates. If breakfast is included in yout rate, only 2 people will receive a free breakfast, even when more than two(2) people are staying in the room. In addition to M Café & Bar, there are dozens of restaurants ranging from creative Puerto Rican & international cuisine to burgers, pizza, subway or sushi – just a block away. All rooms have a/c units; please keep door & windows closed when in use. Fax, Computer & Photocopy available from 9:00 A.M to 5:00 P.M.
Should you wish to connect to the internet, you may use the telephone line which will give you access to an outside line. Located on 8th floor – access through 7th Floor rear stairwell. There is also a very popular jogging track that runs along the lagoon – just one block from the hotel. Dryers located in bathroom; ironing board available in each room closet free of charge. Ice machine on 2nd floor – snack machine 5th floor – Soda machines 3,4,6,7 floors. All rooms are fitted with remote control TV sets. Should you require a baby sitter, please contact reception at least 12 hrs in advance to make arrangements. Car rentals may be arranged through reception. Should you require extra room amenities, please contact reception; they are at no additional cost. Should you have an incoming mail, message or fax, you will be notified as soon as possible by the receptionist and it will be kept at the reception for you. Guest laundry located on the 8th floor access only through the 7th floor rear stairwell. There is also a dry cleaning located just across the street from the hotel. Items found will be handed to management for custody for a period of 60 days. Arrangements can be made through reception. Public bus stop just one block away for Old San Juan or the Santurce Arts District & Urban Train – 75 cents (exact change). Busses run from about 5:30am to approximately 11:30pm. There is no public bus to the convention center – but it is an easy 15 minute walk, or the front desk can call a taxi that will get you there in 5 minutes (approx. $10). Tours & Excursions can be arranged at reception; Please contact the receptionist on duty who will be pleased to provide you with the relevant information on available tours and excursions. Safe deposit boxes are available in every room and free of charge. The hotel is not responsible for the loss of valuables not deposited in the safe deposit boxes. The hotel is not responsible for the loss or theft of property not under the hotels custody or for damages due to natural forces or any act that does not imply negligence or wrong doing of the hotel. If a medical emergency arises that requires medical assistance, please contact reception; if you wish to be visited by a house doctor, you would pay directly to doctor for the visit; if you need to be transported to a hospital, arrangements will be made through the 9-1-1 system. For more regarding this matter please contact reception. For additional security information please refer to the Guest Security & Safety Tips index.